After hotel pickup in the early afternoon, travel by by air-conditioned coach to your first stop, the towering skyscraper of World Trade Center Tokyo. Take the elevator up 40 stories to Seaside Top, an observation deck with 360-degree views of Tokyo. From Seaside Top, your guide points out sights such as Tokyo Tower, Tokyo Skytree and Tokyo Bay. On a clear day, you might even spot Mount Fuji on the horizon. 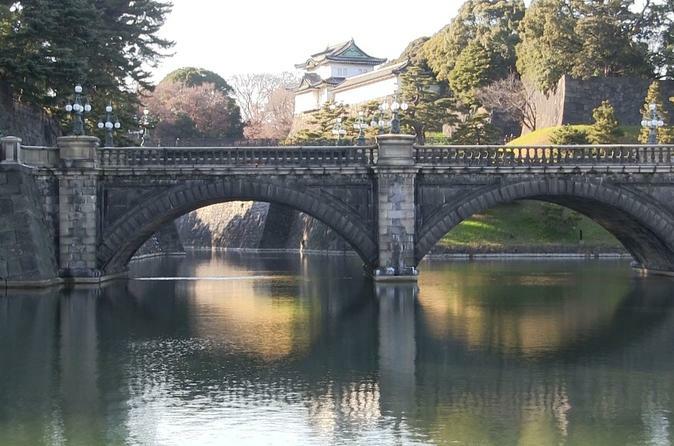 After about 20 minutes, return to your coach and head to the Imperial Palace, where you make a brief photo stop at the outer garden of the palace. Next, drive through the bustling Ginza district, known for its luxury shopping with huge department stores and brand name shops. Your coach then takes you to Asakusa Kannon Temple, Tokyo’s oldest and most significant Buddhist temple. Built in the year 645 AD, the temple combines magnificent architecture, elaborate Japanese gardens, beautiful shrines and grand gates. Follow your guide through the temple and learn more about its history. Then walk out of the Hozomon Gate to the shopping streets of Nakamise where you take in lanes packed with vendors who sell traditional crafts and Japanese snacks. After browsing in Nakamise, head to the river to board your boat for a relaxing 40-minute Sumida River cruise. You'll glide through Tokyo and go underneath 12 bridges, providing a different perspective on the city. Listen to recorded commentary about the sights you pass as you cruise along this historically significant waterway. When your boat arrives at Hinode Pier, reboard your coach for drop- off at Tokyo Station where your tour ends. You’ll receive a complimentary souvenir map of Tokyo so that you can explore the city further on your own.